What in the world was I doing? Standing in the darkened kitchen, chocolate smeared all over my hands and face, trying to make sure nobody heard the noise of my dipping into the leftover birthday cake. I listened carefully to make sure that Walt, sleeping in the hide-a-bed just feet away in the living room, was still breathing heavily, indicating that he was deeply asleep. No, this wasn't diet nightmare I was having, it was the worst of the attack of "eating" I had over the weekend and it was downright scary. I tried not to think about all the times I'd hidden food in the past. I didn't want to remember that for the first time in recent memory I had just weighed myself on Walt's sister's scale, a scale which has refused to weigh me in the past because I exceeded its limit, and that I had seen brand new numbers--numbers not seen in 20 years. I tried not to think about how great it was to fit into restaurant booths, how I wouldn't have to worry about seatbelts on airplanes, and how complimentary everyone had been all weekend long, those people who haven't seen me since last year. I was up to my elbows in leftover chocolate cake and feeling like an alcoholic off on a binge. And the scariest part was that I couldn't stop myself. As I mentioned in last week's entries, I was having some problems, "slipping" now and then. Oh not badly, and not over my points, but still enough that I was a little worried. Worried enough that I packed all my WeightWatcher materials, books, calculators, and even food so that I could be sure to stick with the diet on this very difficult weekend. This Fourth of July weekend is always Food Weekend. It's "FOOD" from all angles-- from the angle that there is more food than I have seen in a very long time, and also that my skinny-as-a-rail sister-in-law spends time talking about how she's too excited to eat, while she puts out mounds of cereal, crackers, dip, sweets, etc., etc., etc. It started with a nibble of this--that won't hurt me. And maybe a bit of that would be OK too. By the time the fireworks ended on the 4th--a mere two hours after our arrival, I'd already fallen off my diet with a resounding thump. But that was OK. It was only one day. Tomorrow I would start afresh. And then at breakfast the coffee cakes came out. One little corner would be OK, wouldn't it? Two corners and three thick pieces later, I had to get out of the house to get away from the food, so I went for a bike ride. When I got back, the kids were there for our bike ride and that was great. Fun, exercise, no food, and feeling terrific about myself. When that was over, we went back to the house, some of the group went off to play golf, and the rest of us sat down to chat. I got upset about something inconsequential and ended up in the kitchen again. Determined to beat this, I forced myself back on the bike again and went out for a long ride (which included the stop at the cyber cafe). Then we went to dinner. There was nothing on the menu which was easily calculated and when the popcorn shrimp and fried calamari was passed around, I had no willpower left. I had chosen fish tacos for dinner, but when Tom ordered albacore, that sounded pretty good. It was probably one of the healthiest things I did all weekend. The next morning, however, was getting ready for the barbecue, sneaking tastes of everything when people weren't looking. We got to the picnic, and waited for the others to arrive, my hands just couldn't stop picking. Picking, picking, and picking. I ate anything and everything and only passed up the healthy things. 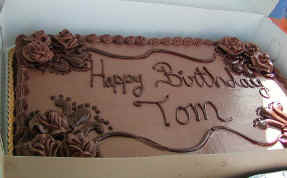 I had deliberately chosen a chocolate cake for Tom, because I don't like chocolate cake. I love chocolate, but generally bakery chocolate cakes (especially grocery store bakery chocolate cakes) are generally dry and tasteless and I really hate them. I deliberately passed up the raspberry filling cakes, which I love. But the frosting was thick and gooey and I decided I'd just take one small taste. It was the best grocery store chocolate cake I'd ever taken, and better than a lot of regular bakery cakes. So I had a piece. A big piece. By the time we got back to the house, they had sent the leftover cake with us, and the box sat on the kitchen counter, with everybody ignoring it. Of course it was the only thing I could think about. I was stuffed full with dinner, but I had to have more of that chocolate. I waited till everyone was asleep and then hit the box and hoped that I took a piece so that nobody would notice that I'd taken some. Then I went to sleep. When I woke up at 6, I had more. And then I had cereal, so nobody would realize I'd just eaten about three large helpings of chocolate cake. I had to get down on the floor and wash up the crumbs I'd dropped. It was a disasterous weekend, and it reminded me of playing Chutes and Ladders as a kid. You work and work and work and slowly inch your way up the ladder until you think you're on secure footing, and then you hit a chute and find you're right back where you started from. Well, I'm not exactly where I started from. I'm minus 60+ lbs (I'm sure I will show a weight gain at my weigh in), and I'm confessing all of this in public, as embarrassing as it is to look at what I've just written. When I got home, 60 Minutes was doing a report on unsuccessful weight loss and what a large percentage of dieters regain all the weight after they lose it. This is the point in a diet where, in th past, I would throw in the towel. I would begin hiding my eating more and more. I would slowly begin to gain weight and I would discuss my dieting efforts less and less in this journal. But I promised myself that this time would be different and that I would be totally honest about it, so I'm being totally honest. I'm also going to go to the WeightWatchers meeting in the morning and get an injection of willpower again. I am not going to become a 60 Minutes statistic. I've had a bad week. But each day gives me a new chance to start afresh, to get that willpower back again. I hit the depths in Santa Barbara. I will not stay there. I will start climbing that ladder again. And I won't even walk past the Albertsons bakery again for a very long time. If this is true, I'm gonna be Twiggy any day now!